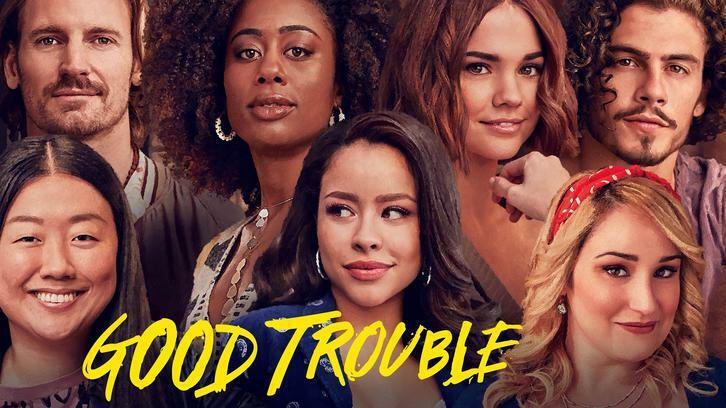 It’s the season one finale of Good Trouble and I can’t believe how fast these episodes have gone by. Luckily, we don’t have to wait too long for new episodes since season two is coming back in June. Malika got a call from her brother at the end of the last episode and misses the protest that she organized. Malika’s story in this episode was utterly heartbreaking since her and Dom’s mother was pronounced brain dead. Malika had her issues with her mother but it broke my heart to see her go through everything that she went through this episode. Alice is preparing everything for Sumi’s wedding which ends up not happening because Sumi called it off. Joey meets Alice’s parents this episode because they suddenly show up at the Coterie. Alice realizes after a few conversations during this episode that she needs to come out to her parents and also accept herself. The scene where Alice calls her parents is one of the most touching scenes in this episode because they already knew but they were just waiting for Alice to tell them. Davia is a true screen stealer this episode in so many ways. She meets Vivian’s dad who tells her how they are homeless and how they are truly struggling. Davia doesn’t judge but she just listens and it’s truly heartwarming to see. She also finds Dennis who checked himself into a facility to get help. The scene between Davia and Dennis definitely made me tear up but I was so thankful that he went and got help because I was really worried at the end of the last episode. The last thing about Davia was that she decided to not go back to Wisconsin and stay in LA but the episode ends with Jeff showing up and telling her that he officially left his wife. Mariana got the salary details from Angela and the women at Speckulate decides that it’s time to go public with the information. A meeting with all employees at Speckulate results in all the women and Raj standing up for each other and admitting to hacking the system to get the salaries, and then a handful of women admits that Josh tried to kiss them, while Evan hears it all. Evan tells Mariana later that he did not know about the salary gap since he avoided all the HR stuff because of his social anxiety. Mariana is thinking about moving on from Speckulate but Evan tells her that she shouldn’t and if she does, she can’t take her app idea with her. The episode ends with Mariana telling Callie that she kissed Raj and I’m honestly liking Raj more now since he has really been there for Mariana and he stood up with all the women at the meeting. For Callie, it is decision time for a lot of reasons. Someone sends her the document from the Jamal Thompson case and she needs to decide if she should show them to Jamal's attorneys or not but that could potentially harm her career as a layer so she is really struggling throughout the episode. The other decision has to do with Gael and Jamie who she shares scenes with and the cliffhanger for this episode is Mariana asking Callie who she is going to choose. Honestly, I don’t like the cliffhanger and I just hope that Callie can maintain a friendship with Gael and keep dating Jamie because I do think he is the right choice for her right now. I did however like that Callie’s love life was not the center of her storyline this episode, but her career was. I just have to end by saying that I loved the Callie versus Callie scene we got when she was debating what to do. 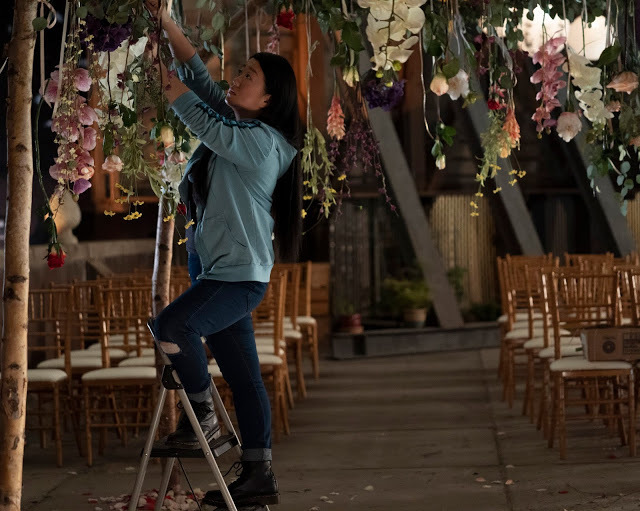 The dance sequence with Callie and Gael, Jamie, Malika and Judge Wilson was a bit weird but honestly, I also kind of liked it because I thought it was imaginative and different. Favorite character: I have to say Davia here, just because all of her scenes in this episode was so powerful. I don’t like Jeff and I have no idea what’s going to happen with them in season two but I loved how Davia made the decision to stay in LA and how she was there for the people she cares about in this episode. I loved the rooftop scene with all the Coterie gang with the exception of Dennis. It was just so nice to see them all together and I think those scenes are some of my favorites of this shows because it just shows that they have created their own little family. I love how people can have the family that they crew up with but also that they can create their own families with their friends. 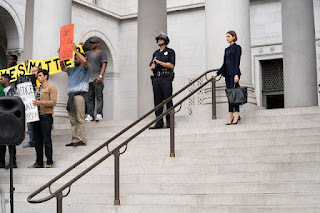 What did you think about the season finale of Good Trouble? Please, let me know your thoughts in the comments below.